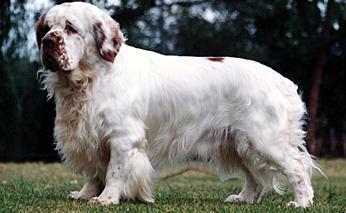 The Clumber Spaniel was developed by the Dukes of Newcastle and their gamekeepers. The breed takes its modern name from the Duke of Newcastle's Nottingham country estate of Clumber Park, which is now a National Trust property and lies in the north of the famous Sherwood Forest. The Clumber was developed to support the Dukes and gamekeepers in hunting this and nearby estates that were usually covered in heavy timber and very heavy undergrowth littered with fallen branches and limbs. The white coat ensured it could be seen in most scrub and its build ensured it could penetrate into the depths of that scrub and flush game hiding there or even retrieve shot game. 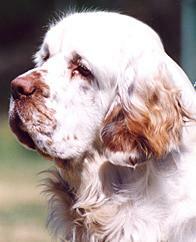 The Clumber Spaniel arrived in Australia in 1883, the first coming direct from Clumber Park. Clumber Spaniels can normally live up to 13 years of age, but with correct nutrition and a fun-loving environment will live to 15 years. As with all breeds the temperament is generally the result of the way the dog has been cared for and raised. Overall, the Clumber Spaniel is extremely kind, thoughtful and easy to get on with. They have a deep-seated desire to please their owner and the owner's family, but cannot take the rigours of being forced trained or regimentally drilled; they need the opportunity and time to observe and assimilate how other dogs perform for their owners and will mimic this behaviour. This heritage of working in the field is translated into a little independence, particularly when tracking, but they soon check their owner's whereabouts and will look to them for advice if the trail is clouded or lost. Their heritage as a field working dog translates into being happiest in a "pack" or kennel situation with a canine friend for company, and generally a Clumber is preferred, although they adapt well to other non-dominant breeds and so many individuals during the years have been ecstatically happy in single dog families. As a working breed, the Clumber Spaniel has a natural desire to hunt fleeing or panicking small mammals or birds. Provide these types of pets with security and the Clumber will live in harmony. He loves most other breeds of dogs, but is easily intimidated by the more naturally aggressive breeds; the Clumber is almost servile in his nature, and domineering dogs should not be coupled with this breed. The Clumber Spaniel is one of the most low maintenance of the spaniel family; from about 10 months of age they will need their feet trimmed every two months and from about 12 months of age the feathering under the ear hole and from the wrist to the foot on the front legs and from the hock to foot on the hind legs will also need to be trimmed every two months. The Clumber is ideal for those people alert to a dog's body language and general health requirements, and essentially compassionate. The ideal owner will make sure the Clumber is exercised twice daily, groomed weekly, and trimmed every eight weeks. The ideal home will have a reasonable sized grassed back yard, with a smaller day yard set within the boundary. Parks or good walks will virtually be on the home's doorsteps; and be inviting and interesting to the dog and to the owner. The Clumber has no problems adapting to being a house dog, but his health is best served if he can spend the days in a small outdoors yard (with appropriate bedding and shelter) and have a good romp through the whole garden under supervision. *** We have vetted and approved these independent breeders as meeting, at the time, our criteria for the reliable breeding, feeding, care and sale of suitable quality puppies of this breed. This does not mean that other breeders do not meet these criteria or are not otherwise suitable suppliers. Nor can our vetting and approval guarantee the quality of a breeder or puppy or that you will be happy with them. We disclaim any liability for the quality, acts or omissions of these breeders or their puppies and our approval of breeders is not a substitute for you making all appropriate enquiries and checks (including veterinary checks) before choosing a specific breeder or puppy. Sign up to receive updates from OPTIMUM™ and brand ambassador, Dr Chris Brown.